In reality, the painting was a varnished photograph of Gene Tierney, its alluring quality a trick of director Otto Preminger’s camerawork, which emphasized her eyes in reverse-shots and low lighting. It’s one of many paintings that played a narrative role in the Hollywood film noir of the 1940s and ’50s, where this artistic double fit with the self-reflexive nature of the cinema style, and the presence of duplicitous femme fatales. In the 2013 book The Dark Galleries: A Museum Guide to Painted Portraits in Film Noir, Gothic Melodramas, and Ghost Stories of the 1940s and 1950s, published by MER. Paper Kunsthalle, art and film historians Steven Jacobs and Lisa Colpaert created a fictional museum guide to archive 100 of these portraits. On April 5, the Swiss Institute in Soho hosted a talk with Jacobs based on the book, in conjunction with the current exhibition, FADE IN: INT. ART GALLERY – DAY, which explores the role of art in film. The show includes one actual 1940s film painting — Henrique Medina’s “Portrait of Hurd Hatfield as Dorian Gray,” created for the 1945 screen adaptation of The Picture of Dorian Gray — as part of Cindy Sherman’s “Evil Twin” piece, which hides a second, presumably ghastly, painting behind a velvet curtain. In actuality, the decayed picture from the film, which kept Gray young despite his age and horrendous deeds, is in the Art Institute of Chicago. Painted by Ivan Albright with garish colors suggesting Gray’s inner deterioration, it’s rare among 1940s film portraits in being not just a real painting, but a modernist one. As Jacobs put it in his lecture, the film noir portraits are mostly “country club realism,” and don’t necessarily reflect the artistic movements of the early 20th century. “When a portrait is painted in a modern style, the plot focuses on the relation between the artist and the model,” he added. 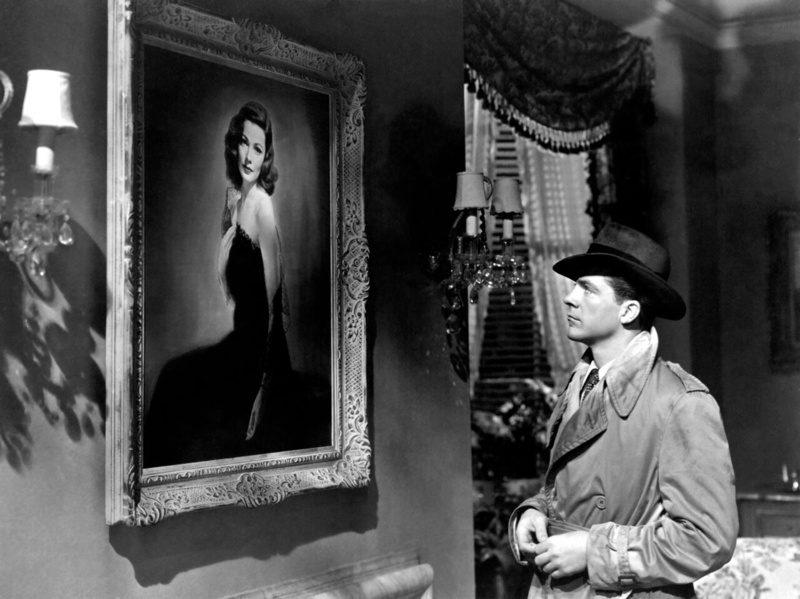 For example, in Fritz Lang’s 1945 Scarlet Street — for which painter John Decker created a whole body of surrealism-influenced work — the plot revolves about a man’s attraction to a woman whom he also asks to pretend that his art belongs to her, part of a larger web that eventually destroys them all. The last shot is of her “self-portrait” being posthumously sold, while the actual artist shambles by as a homeless bum. Yet on the whole, the artwork is itself unremarkable, and even sometimes shockingly bad. Jacobs pointed out a “Raphael” that figures in The Dark Corner from 1946, which would be more believable as the cover of a Renaissance Fair-set bodice ripper romance novel. In each case, however, the filmmakers managed to make these portraits as living a presence as the actors, and ones with their own secrets. “It’s striking that when an artwork is featured it a film, it denotes mystery,” Jacobs said, adding that there’s “at least a secret wall safe” behind the most innocuous of them. He noted that back in the 19th century, in early film, statues were constantly coming to life, and likewise these static portraits seem to be commenting on how film is a very different art form, one defined by its animation. And by almost being entirely portraits of women, these paintings also represent a male gaze for stories in which a woman is so often the beginning of the protagonist’s downfall. In the 1944 film The Woman in the Window, one moment a man is admiring a portrait in a storefront, and as soon as the actual subject appears in the reflection, he’s on his way to murder. Most of the artwork from these films is now lost, as it was treated as a disposable prop. Jacobs said that if they were to stage an exhibition “of the 100 examples, we could only assemble a dozen.” But preserved in the films, these portraits retain their vitality. Through the rising strings of Bernard Hermann’s score in Vertigo, where the twirl of a woman’s hair in a gallery portrait foreshadows the twists of the film, or the looming painting of the woman in the white dress that summons the ghost of the title character in Rebecca, after the second Mrs. de Winter recreates her garb, they take on a hypnotic power. FADE IN: INT. ART GALLERY – DAY continues through May 19 at the Swiss Institute (18 Wooster Street, Soho, Manhattan). Steven Jacobs and Lisa Colpaert’s The Dark Galleries: A Museum Guide to Painted Portraits in Film Noir Gothic Melodramas and Ghost Stories of the 1940s and 1950s is available from MER. Paper Kunsthalle.